It is a requirement of your Agreement, that the goods are protected against Theft and Accidental Damage. We can arrange Theft & Accidental Damage Cover for £1.62 per week. It is a requirement that products purchased on a credit agreement are insured. We can offer Theft and Accidental Damage Cover for £1.62 per week. Experience the most spectacular graphics on every game and film with the PlayStation 4 Pro – with 4K Ultra HD resolution and HDR compatibility. Featuring twice the power as previous models, the PlayStation 4 Pro achieves faster and more stable frame rates as well as incredibly lifelike details for unprecedented gaming quality. Making every action smoother and each colour bold and bright, the PS4 Pro also upscales lower resolutions as close to 4K as possible. Not just for enhanced gaming, the Ultra HD capability lets you get the most out of 4K Netflix and YouTube content. Stream your games to multiple devices and share your progress with your friends in beautiful 1080p Full HD, so that you can re-watch your successes in great quality. 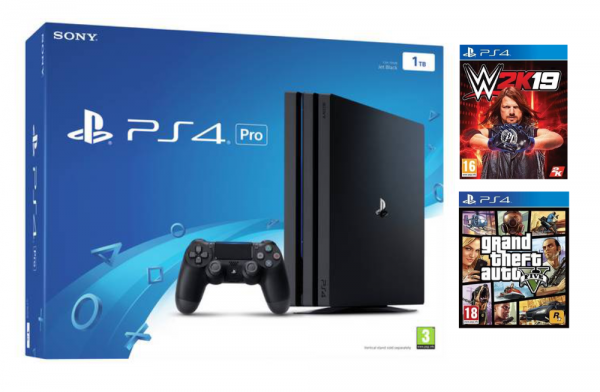 Combining a super-fast processor with jaw-dropping 4K graphics and a massive 8 GB of DDR5 system memory, the PS4 Pro has all the same features as the ground-breaking PS4, except with smoother, richer graphics and incredible detail in every moment. Included with the Sony PlayStation 4 Pro is the DualShock 4 controller, which gives you complete control and lets you interact with your games in both familiar and unexpected ways. The dual analogue sticks and improved buttons offer enhanced precision, plus there are integrated motion sensors, touch controls and the innovative ‘Share' button. Use the built-in mono speaker and headset jack to enjoy detailed, high-fidelity sounds through the controller and online chats with friends using a headset. The action takes on a new intensity with enhanced vibration motors, and the shape provides enhanced comfort. Using the Touch Pad on the front of the controller, you'll experience a freer way to play. Able to connect to super-fast 2.4G Hz and 5 GHz broadband speeds, you can enjoy enhanced dual-band WiFi with the PlayStation 4 Pro – letting you download games and connect with your friends quicker than ever. With the Sony PS4 Pro you'll enjoy drastically reduced lag time between you and your content. Suspend Mode keeps the system in a low power state while maintaining the game session for extremely fast console boot-up and load times.